While filming a segment of The Grand Tour in Switzerland in June, host Richard Hammond tumbled off of a hill climb course and the electric supercar he was in wound up in flames. The FIA and others later launched an investigation into the crash, and the findings left the hill climb’s organizers in all kinds of trouble. 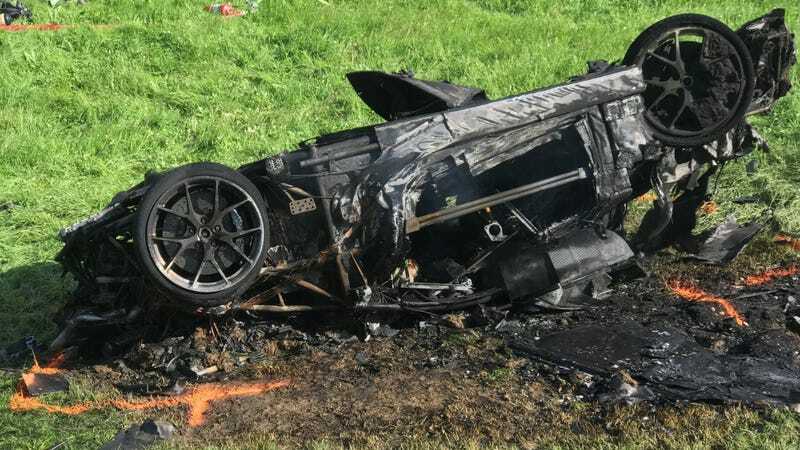 Auto Sport Schweiz, the Swiss motorsport authority, announced Monday the “illegal” actions it deemed organizers to have taken leading up to Hammond’s fiery Rimac Concept One crash at the Hemberg Hill Climb. The announcement said The Grand Tour’s filming went on at the same time as the opening round of the Swiss Hillclimb Championship at the course, and that the race organizers weren’t following motorsport regulations during the show’s filming. Hammond and the other hosts weren’t official race participants, Motorsport.com reports. The report also indicated that the investigation into the crash led to six-month license suspensions of the race organizer and three stewards, as well as a roughly $5,000 fine. The report, noted as translated from a Swiss journalist by Motorsport.com, said it is “understood” that the future of the racing event there is in jeopardy, but didn’t make note of where that knowledge came from. - In accordance with its own regulations, the organizer has further reinforced Article 6 of the CSI and requires demonstration vehicles to be accompanied at all times By a leading vehicle and a tail vehicle. - The organizer had also specified in his specific regulations that the wearing of a helmet and a racing suit conforming to the FIA ​​regulations were mandatory during the demonstration races. But it has been proven that the rider was wearing only helmets and wearing everyday clothes. - It appears from the organizer’s publications that a demonstration (production) took place within the event without prior notification to the SSO. For the organization of these races, the organizer received a financial compensation from the production company. The production was subjectively perceived by him as taking precedence over the championship race that took place within the framework of the Swiss Coastal Championship 2017. - It is nowhere specified in the documentation (announcement, appendix, etc.) that a vehicle Of the Rimac brand was going to participate in the race and especially that it was an electric vehicle. Due to the lack of information on this subject, The marshals, spectators and those involved were exposed to additional risk (the recovery of an electric vehicle requires additional protective equipment and training). In essence, the governing bodies determined that they did not believe race organizers to be following safety guidelines in the clothing worn by Hammond, disclosure about what kind of car it was or driving practices on the course. Auto Sport Schweiz also seems to think that the show became more important than the race due to the financial compensation given in order to film there. Each organizer who registers for a competition accepts by its registration the regulations in force and undertakes to respect them. In case of faulty behavior or violation of the regulatory requirements relating to the event, this may result in a procedure and the corresponding consequences. It seems that the organizer has not complied with its own regulations as well as with the various regulations of Auto Sport Switzerland. The organizer is subordinate to the legal bodies of its national association and by extension also to the FIA ​​(International Automobile Federation) as are licensed pilots, commissioners, officials, etc. Auto Sport Switzerland does not investigate regular racing accidents, caused by licensed drivers, but launched an investigation because these are illegal demonstration races. For its part, the FIA ​​has expressed its interest in the “technical part” (vehicle, damage, triggering, etc.) of the accident, as electric vehicles are increasingly becoming a topical issue, In principle, they are not well seen during races or in the context of such events. It is the responsibility of the national association Auto Sport Switzerland to deal with breaches of regulations. In addition, other Swiss rally organizers have rejected the demand of the company responsible for this production for safety reasons. Jalopnik has reached out to The Grand Tour for comment and to see if the show was at all impacted by the investigation, and we’ll update if we hear back. The announcement said those impacted by Auto Sport Schweiz’s decision will have the chance to appeal.